Limited edition Rilakkuma store opens in Kyoto! 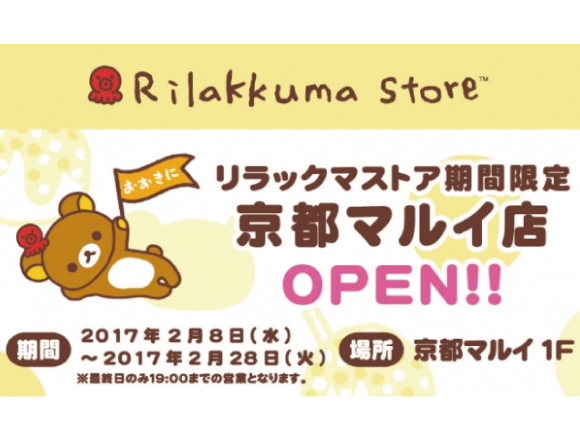 A special store dedicated to famous character “Rilakkuma” will be opening on 8th February in Marui Kyoto shopping centre. This store will be open for a limited period only and is themed around the concept “Happy life with Rilakkuma”. In order to commemorate the opening of this store, customers who spend more than ￥2,000 at a Rilakkuma store in the Kansai area will be given a “Kansai souvenir sticker”. This is on a first-come-first served basis. Rilakkuma’s Kansai dialect is so cute, and this is a rare, limited edition sticker so don’t miss out! The sticker design at each store is different, so maybe you could even start collecting them! ■Related article：Popular picture book “Kuma no Gakkou” celebrates 15 years with Jackie’s limited edition bakery goods! ■ Related article: Invite that special someone to the new love-themed “Hello Kitty Café” in Osaka!